I would like to give a shout out on this cloudy and overcast (well, at least here in Edinburgh) father's day, to my dad. He really should be awarded father of the millennium for all he has had to put up with...three hyper active children can do that to you! But today, instead of telling stories of how great my dad is, in which there are many, I would like to share some of my traits I have gotten from him. 1. Love of cars - I remember helping my dad fix up the old VW Bug (I think there were actually two different ones...plus a bus!) on Hazelwood and that blue Mazda (or whatever it was) on Aster Drive. Let us not forget the numerous times we have gone to car dealerships to look or just admired a nice car as we passed by. 2. Love of all things food - Seriously, my dad and I will eat about anything. I remember sharing artichokes, anchovies and tuna with him when no one else in the house would even come close! 3. Olive skin tone and brown hair - Whenever people who know you meet me, I always here, "You must be a Booth." I definitely look a part of the family! 4. Sarcasm - Dad, I would just like to remind you that sarcasm hurts people! I think we have both learned a lesson or two in that...yet we are both still sarcastic people. 5. Hyperactivity - I think you have learned to control your hyperactivity better than I have, but I know it is still in there! Right now I am thinking of you in Houston on Sunday night! 6. Walks - We both like 'em, and we both like 'em even better with company! Though I am sure there are many more, all I am trying to say is I am definitely my father's daughter. 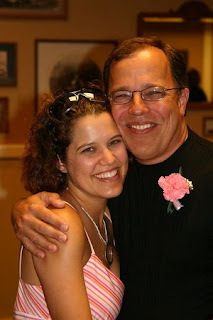 Dad, I love you and wish I could be with you on father's day. Just look at Riley and think of me!